All issues of our biannual Magazine are available for download on our other website, but that is restricted to Members, so here we present a few sample stories to whet your appetite! As the cover with its visual pun suggested, Issue 50 from October 2012 both looked back at some of the history of The Moxon Society as well as articles about some Moxon family history; we also looked forward to another 50 issues in the future, and more specifically to the impact of modern, electronic media. The first item I received was a flyer that came out of certain James Moxon of Asford Carbonel, Ludlow. It informed me that he was going to publish a book entitled, “The Moxon of Yorkshire” for the princely sum of £10. 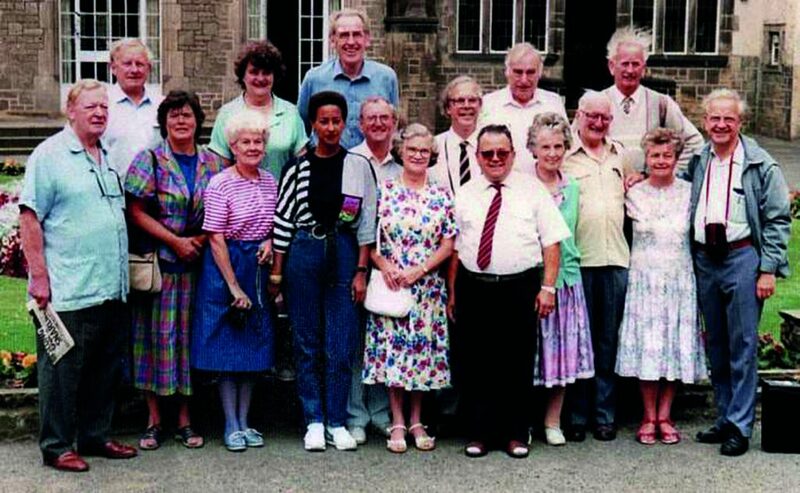 Having Yorkshire ancestors I responded with a cheque for the £10 and awaited the book. The next thing was a letter from Ghana (but posted in England) dated 16 March, 1987 thanking me for the cheque and for my interest. I finally received the book in August 1987. In many ways we must “play it by ear,” avoiding too many tempting but time-consuming church halts but endeavouring to him by as much of the geography and history of our heritage homeland as we have time to do. Editor’s note: Jimmy was nothing if not enthusiastic and extremely energetic! Nor was he ever one to miss a trick: the 27-seater was, of course, owned by… Moxon’s Coaches! [Mrs JWH] also kindly sent photographs (left) and copies of newspaper cuttings of another of her relatives, one Cissie Moxon who was a successful and popular artiste with her own touring company. 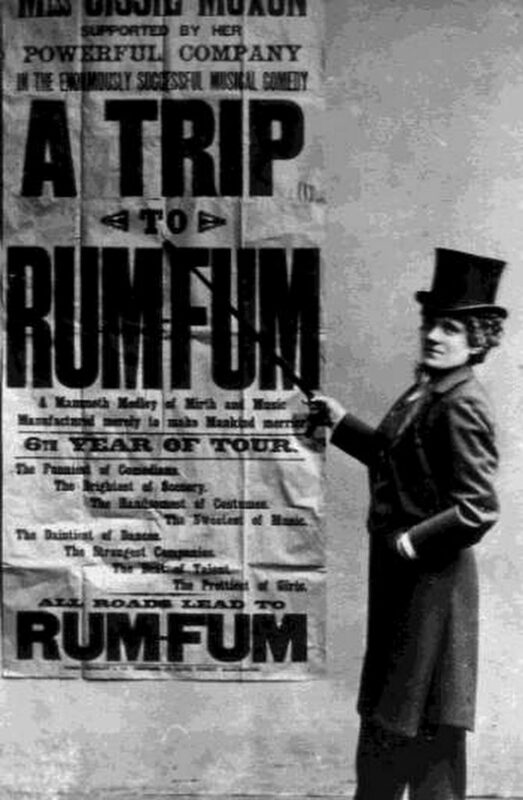 They had a long run with the musical comedy “A Trip to Rumfum” and many other shows. 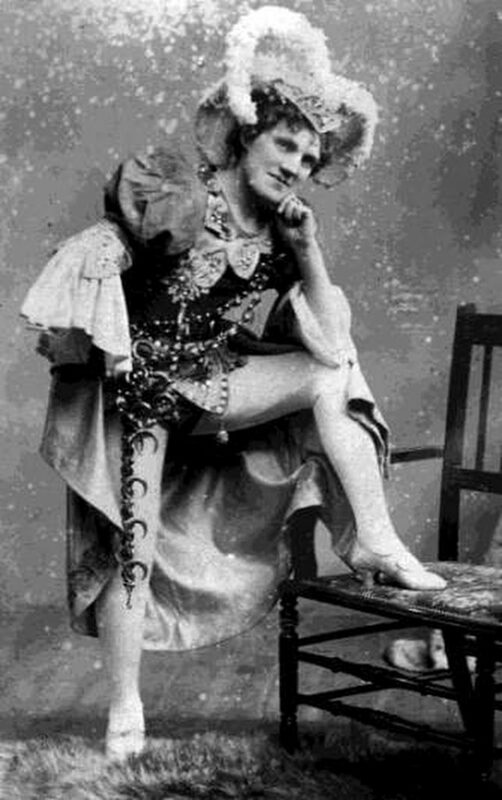 Among her fellow artistes was a Mr WS Hutchinson, sometimes referred to as ‘Professor’ Hutchinson who gave ’clever performances’ with his ‘funny family’ of talking dolls, and was, according to one report, ‘a clever impersonator of female characters.’ Were they related? Editor’s note: we still haven’t had an answer to that question, so if you can help… please get in touch! A monthly collection of miscellaneous short notes, or occasionally just one of the Editor’s brainwaves… Here a running commentary on the content. THIS ISSUE OF THE MOXON MAGAZINE has been a delight for your Editor! I have received more material than ever in the past, so much that some has had to be held over to another issue. My most sincere thanks to those who have submitted articles and other editorial material. A special personal thank you to Chris Moxon & Philip Lord who, as well as being seemingly indefatigable contributors to the Magazine and tireless overseers behind the scenes of the Tree Guardians scheme, also found time to proofread this issue. Any author and any editor these days, using electronic word processors and the like, finds it too easy simply to cut and paste a submitted article and to miss the inevitable typographical errors and even the occasional spelling errors: online spell-checkers are not infallible! Though I must stress that the final responsibility lies with me, so if you spot errors and omissions please tell me. 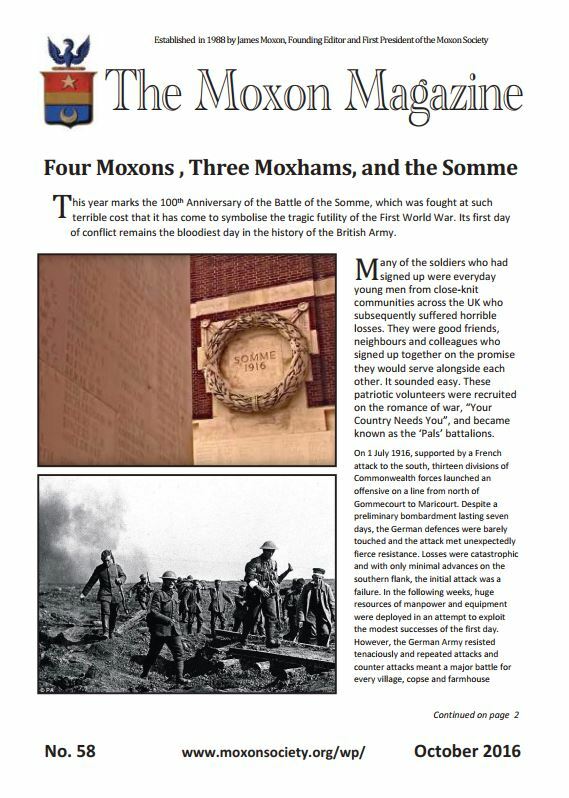 Having said all that, we have a wide-ranging issue for you, ranging from commemoration of Moxons and Moxhams who died in the Battle of the Somme a hundred years ago; to self-penned obituaries, and discoveries about gravestones; a blazer badge which raised queries about genealogy, and of course the group photo from our 2016 Moxon Gathering in Leicester. We have the story of a Moxon who was confined to a lengthy stay in a sanitorium with tuberculosis and found a unique way to pass at least some of his time; and much more which I hope you find of interest. 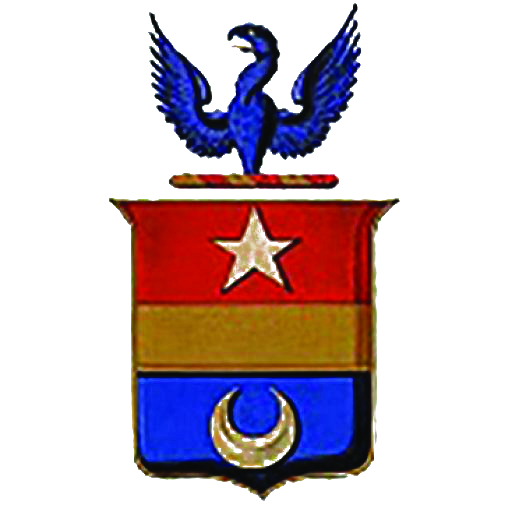 I hope you will continue to flood my in-tray with new articles and ideas for new articles, queries, news and history of all things Moxonian, not to mention Moxhamian, Megsonian and all the other variations of the name which, fascinatingly, are coming ever closer together as links are found between trees. OVER THE COURSE of the 2016 Moxon Gathering, which by the way was most enjoyable in all its social and historical aspects: it was a great delight to meet members old and new. We heard the history of the finding of Richard III’s body and its subsequent re-interment fascinatingly and well told at first hand by our guest speaker, The Revd Pete Hobson. Pete was Acting Canon Missioner at Leicester Cathedral during the time of the reburial and he is a Moxon Society member, nephew of our founder Jimmy Moxon. 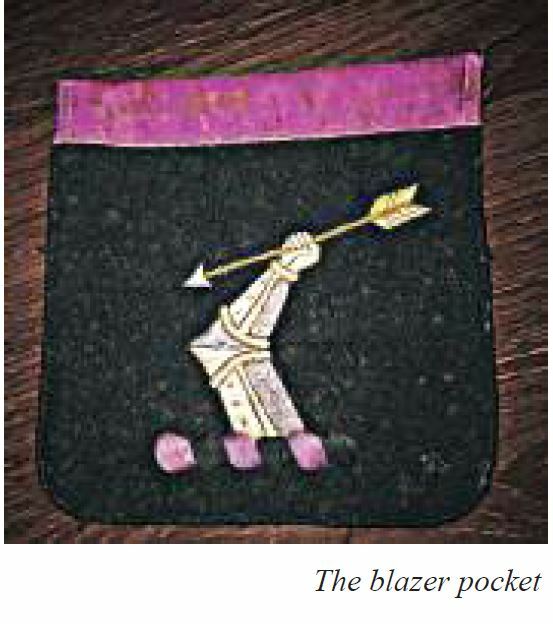 But over the course of the weekend Harriet Cozens produced a blazer pocket bearing a coat of arms which Graham Jagger had assured her was the official coat of arms of the Moxon Family.